I made a bride cry on her wedding day. And the next day, I made this beautiful pregnant mama cry. I know what you're thinking... "how dare you, you evil monster!" But don't worry, they weren't hateful tears or sad tears, they were tears of joy and emotion. Honestly, my instant reaction to both times was to apologize and crack a joke, but I had to remind myself that wasn't the purpose. I had asked them both tough questions. I wanted them to be open and vulnerable for a moment. Not because I wanted to take pictures of them crying, but because I wanted to capture them in raw, genuine moments. Pictures where they were thinking, not just blankly staring at my camera. Often times, as photographers, were expected to stay distant and keep a professional client/vendor relationship. To pose and take "smile and cheese" pictures. Were supposed to be silly and make people laugh, and ignore anything too deep or revealing. I guess part of me understands, but that's not who I am at the core. I want to be real and honest and see people past the surface. I want to see who they are. To have relationships that go past people handing me checks. I asked Bri to think about this wonderful gift of life she's been given. How she's bringing a baby boy into the world and what she wanted to teach him. I asked her to think about the kind of father her husband would be and how their love created this little one. I had no idea that would bring tears, but thinking about those beautiful things brought out these beautiful emotions. It was no longer about having pretty pictures, it was about capturing the emotions and feelings Bri and Trevor are having during this special time in their lives. I'm so thankful they allowed me to break down some walls. 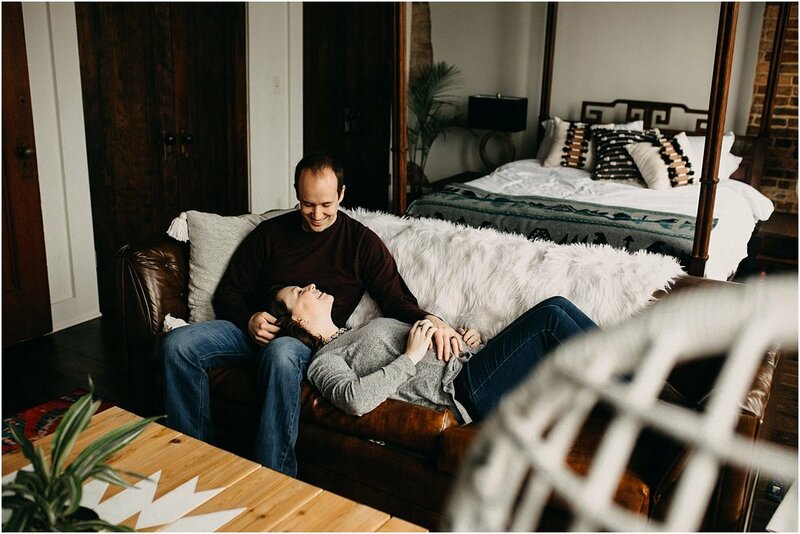 Here's what Bri said about their experience: "We got our maternity photos taken on Sunday with our dear dear friend Kyndal who owns Inner Images Photography! In our session, she told us she wanted us to focus not just on little man but more so on the love that Trevor and I have for each other. We got to talk about the things we are so excited for, she asked Trevor and I separately why we are excited to see each other as parents, why we love each other and as we left the session and talked about it for the next few days we were just reminded of the power of love. Through the ups and downs of this pregnancy, my love for Trevor has grown so much! To watch this man care for me, lift me up in prayer, allow me to cry on his shoulder when needed, comfort me, lead me to seek our Lord, pray for Griffin and his future, and so much more! God keeps speaking to me and reminding me that yes Trevor loves me so much but God loves me even more! When Trevor and I are honoring God in our relationship more and more we see God truly abide in us! We see glimpses of how powerful God's love for our new little family! We see ourselves being drawn to His presence more and more and drawn to love each other better as Husband and Wife! While this pregnancy was not what I have envisioned completely, it has been one of the most precious and fulfilling moments and I am so thankful I get to watch through this with the love of my life! We cannot wait to see the rest of the photos from our session because we love the sneak peak!!! These will forever hold a place in my heart as I look back and I am reminded of the love Trevor and I have and the more powerful love our God has for us!" << OKAYYY I'm crying now! Gosh. Enjoy some pictures from their session!